The Art of Halo 5 is an awesome sci-fi game artbook. It's as good as, if not slightly better than, Awakening: The Art of Halo 4 which is the artbook for the previous game. Nicolas Bouvier, aka Sparth, is the art director for Halo 5. No wonder the art direction and style looks so familiar. If you've seen Sparth's artbooks, you'll recognise the strong use of black as composition elements to frame scenes, and the subtle but colourful gradations in environment art. Highlight of the book to me are the amazing environment art, mostly by Sparth, Shae Shatz, John Liberto and Darren Bacon. The designed locations look breathtaking. The vastness, space, sci-fi-ness (if there's such a word) are well captured. To top it up, many of those pieces are printed across the spread which gives it an immersive feeling. I can imagine these as huge paintings that can be framed and mounted onto walls. They look real good. Rest of the book comprise of designs for the characters and weapons. Character designs are more of an evolution because we have already see Master Chief countless time. It's just an update. There are the enemies, which aren't a lot, relatively speaking in terms of coverage in this book. Another thing to look out for would be the designers' commentary which are insightful and explains the rationale behind each design. As I'm writing this review, the game is not out yet, so I've to warn you that there are lots of spoilers within as the book covers a lot of ground. It's a fantastic video game artbook. It's hardcover with 208 pages. 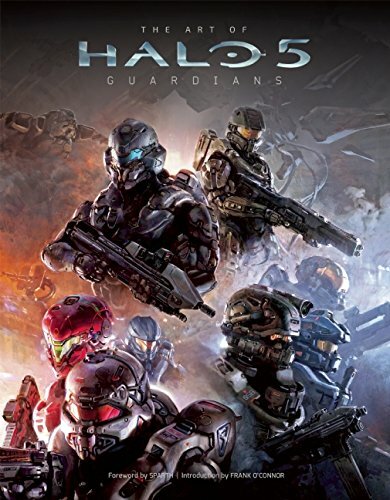 Highly recommended to Halo fans and those who love sci-fi art and environments.